ON June 6, 1944, Operation Neptune marked the beginning of the invasion of German occupied Europe by the Allied Forces under the command of General Dwight D. Eisenhower. The Second World War invasion on the Normandy coast of France became commonly known as D-Day, and was the largest amphibious assault ever executed, involving five army divisions supported by over 7,000 ships and 11,000 aircraft. Plans for D-Day were underway months in advance. It is a little known fact that American regiment, the 654th Engineer Topographic Battalion, which was based in Tetbury (UK), had a key role in the success of the invasion, which was a major turning point of the war. 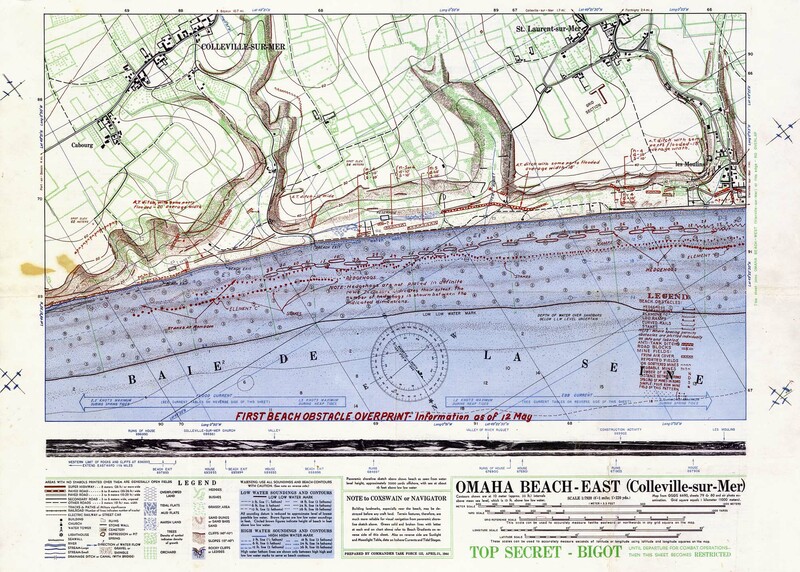 As part of a top secret project, the Tetbury-based troops devised a 3D map of Omaha Beach which became a vitally important tool used to capture the beach and move inland. Tetbury historian, Merlin Fraser has researched the work of the 300-man regiment, uncovering how they produced eight million ordinance maps, which helped American troops plot their route to Germany following D-Day. Merlin is documenting his findings in a book called the Americans in Tetbury and together with Tetbury Town Council he has worked to install a plaque in the town to commemorate both the 70th anniversary of D-Day and the GI’s work in the town. “In the grand scheme of all things historical what happened in the small Cotswold market town of Tetbury during the six months prior to those landings paled into obscurity overshadowed by the true horrors of war and what happened on those beaches that day,” Merlin said. “The American soldiers stationed here were not front line troops and they were not part of that first day, however the work they did was of vital importance to the preparation, planning and execution of both Operation Neptune and Overlord. The plaque, in the north-east corner of the Chipping car park, will look towards the old Malt House, where the 3D model of Omaha was created. It is being unveiled on Friday, June 6 at 11am by Tetbury mayor Sandra Ball. Aerial photo shows troops landing on D-Day at Sword Beach, France on June 6, 1944. The battalion was split into three sections. Company A, was based in and around the town, including the Old Malt House and was responsible for turning aerial reconnaissance into maps. Company B was based at nearby Chavenage House and printed the maps. Headquarters and the battalion’s officers were also based there. Chris Tubbs Deputy Chief Forecasters at the Met Office UK uses original weather charts for the day of the invasion, Tuesday the 6th of June. 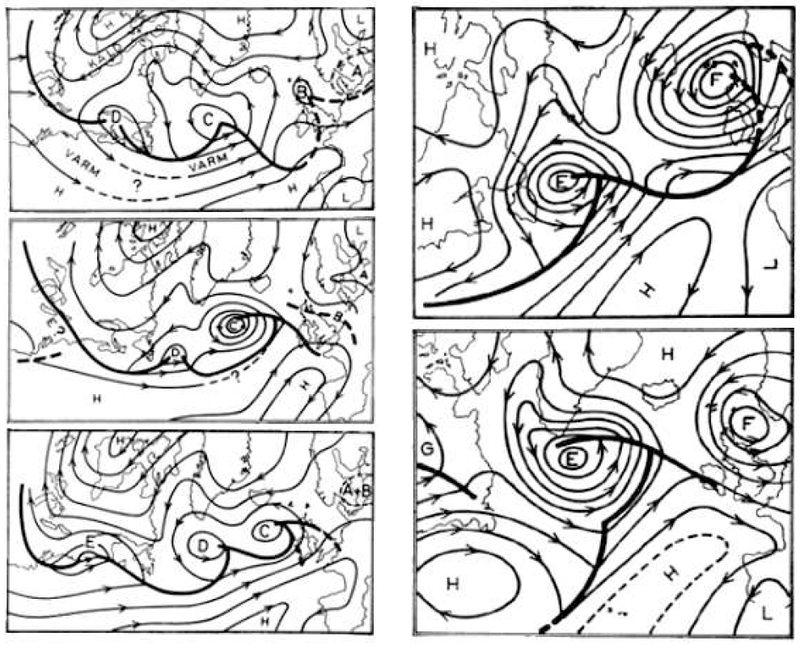 He shows how there were brisk, north westerly winds coming across the country. However some shelter from the wind and waves was provided in the Channel, enabling the allied, invasion troops to land successfully in Normandy. In total, 75,215 British and Canadian troops and 57,500 US troops stormed the beaches on D-Day. with 23,400 landing from air by parachute or glider. Prepared by the Commander Task Force 122, April 21, 1944. "Map from GSGS 4490 Sheets 79 and 80 and air photo examination. Grid square equals 1 kilometer (1000 meters)." "TOP SECRET - BIGOT Until Departure for Combat Operations -- Then This Sheet Becomes RESTRICTED". 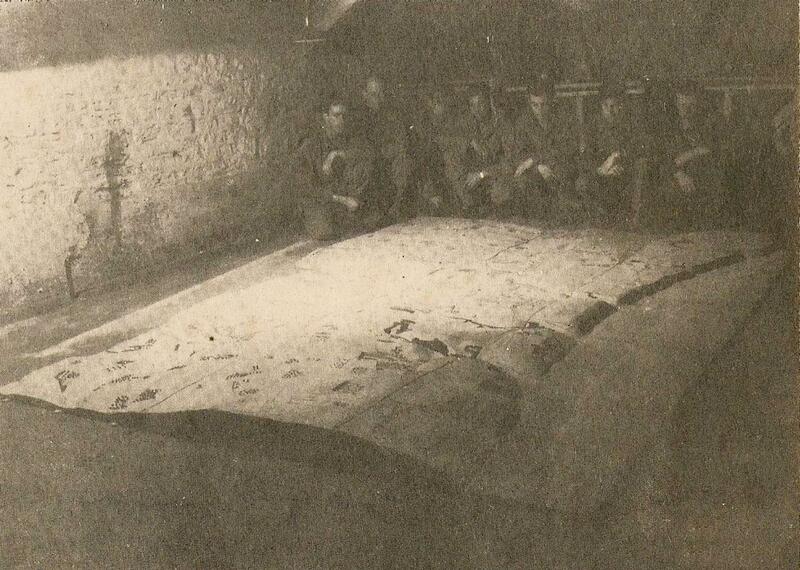 After the Normandy Beaches success, the 654th Battalion followed the army across Europe, taking their survey, mapping and printing skills with them. 'Approaches to Arromanches les Bains'. 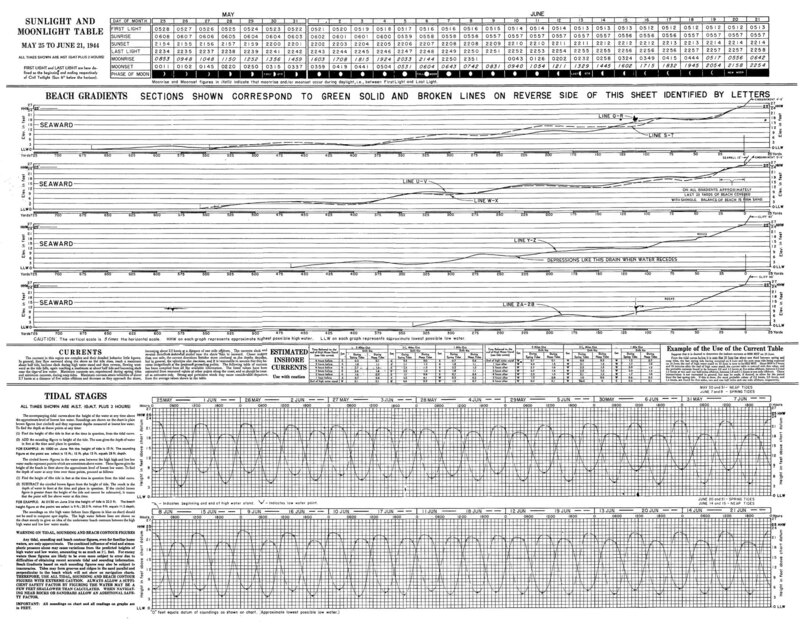 A chart produced by the UK Hydrographic Department in July 1944 showing the layout of the harbour and soundings collected by HM Motor Launch 1001, the inshore survey vessel assigned to Mulberry B. A photo mosaic from August 1944 showing an overview of Mulberry B as it was when in service. 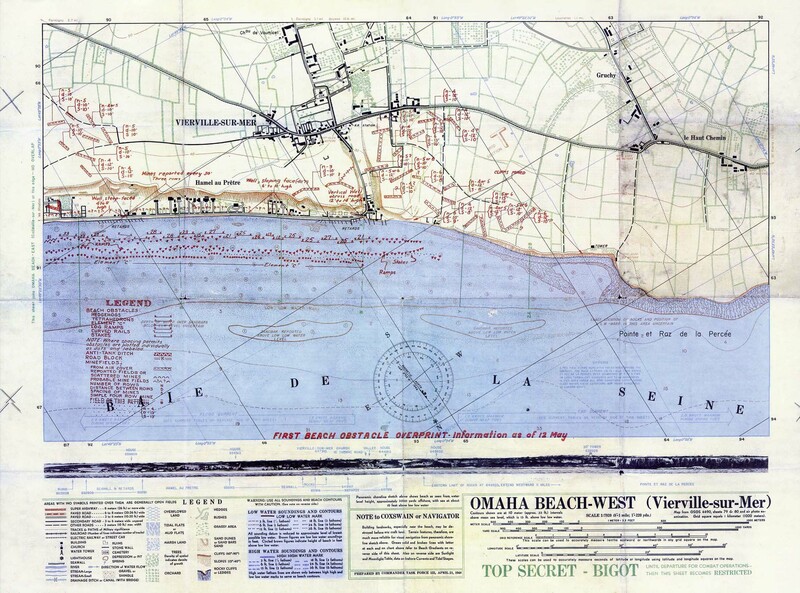 Gigapan : D-Day map used by the allied forces to plan and execute the D-Day landings. Hurricane season starts again this June. Do you know what happens to our coasts after these extreme storms? 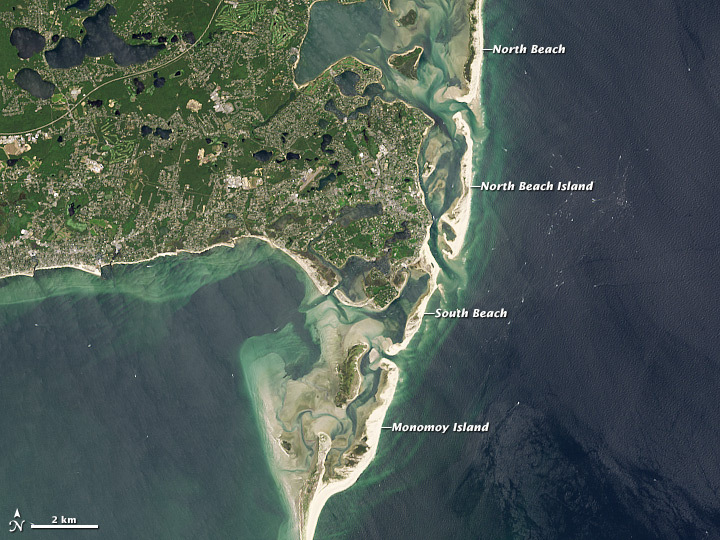 Since 1995, the USGS has collected more than 140,000 aerial photographs of the Atlantic and Gulf coasts after 24 hurricanes and other extreme storms. Just for Hurricane Sandy alone, more than 9,000 aerial photographs were taken a week after the storm. USGS acquires high-resolution oblique aerial photography after extreme storms and compares them to imagery collected before the storms. These aerial photographs are taken at a low altitude to capture a small area of the coast. 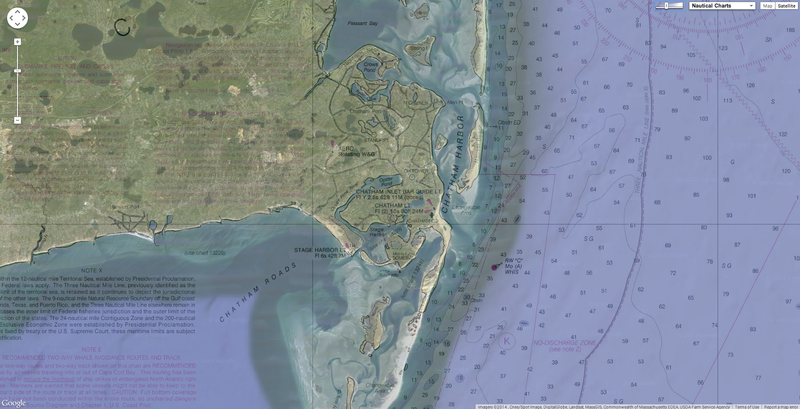 USGS collects aerial imagery to ground truth and improve the USGS coastal change probability models. 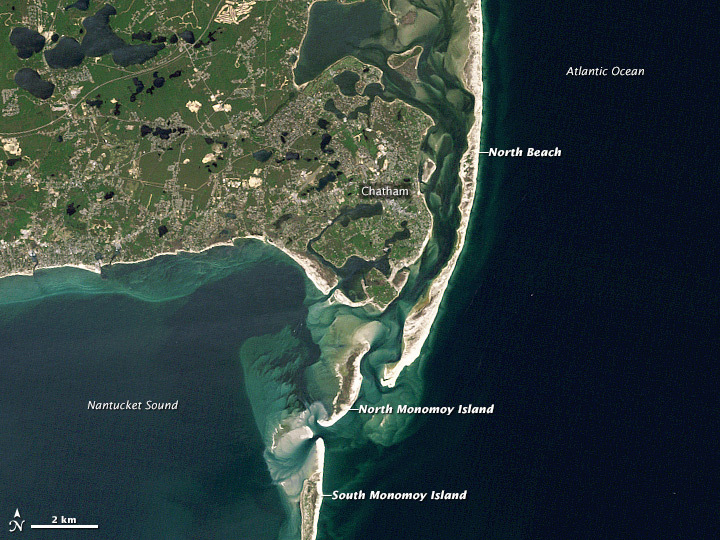 “Computers cannot yet automatically identify damages and geomorphic changes to the coast from the oblique aerial photographs,” said Sophia B. Liu, USGS Mendenhall Postdoc Fellow. 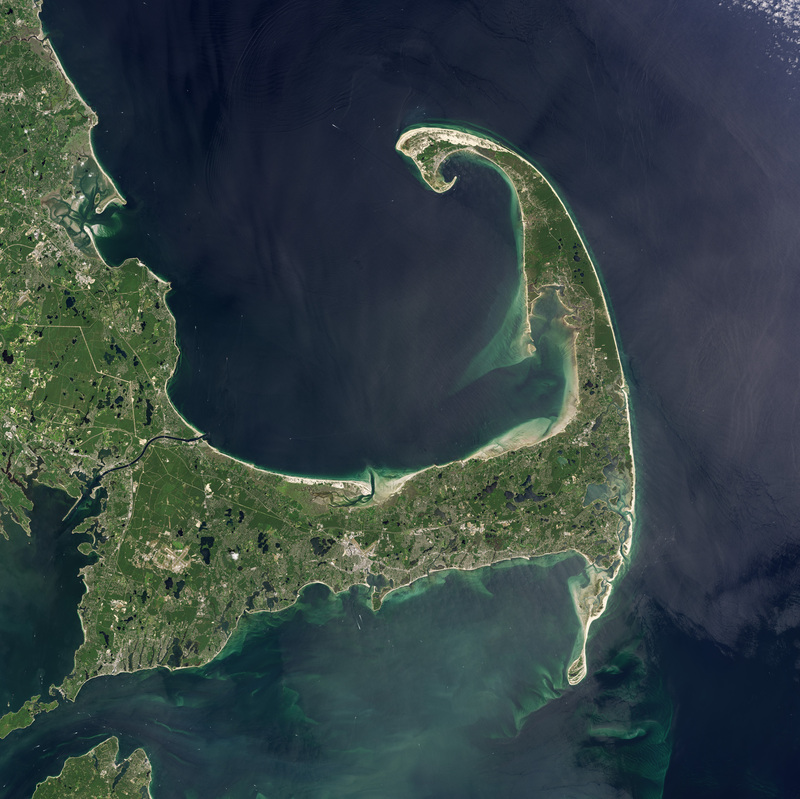 Analyzing the aerial photographs to identify storm damage will help coastal scientists refine their predictive models of coastal erosion and damage caused by extreme storms. Currently, these mathematical models are derived from dune elevation and predicted wave action during storms. Adding the human observations will allow the scientists to validate the models and to provide better predictions of damage before storms occur. “After an event like Hurricane Sandy there is always a great interest in our photographs,” said Barbara Poore, USGS Research Geographer. There are scientific, technological, and societal benefits to the iCoast project. 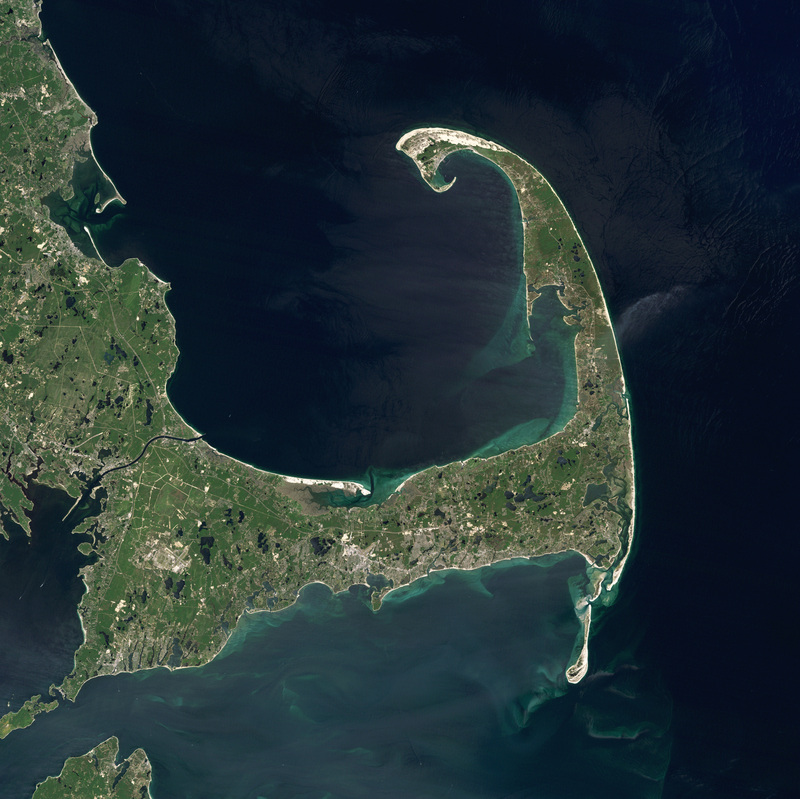 The crowdsourced data from iCoast will enhance predictive modeling of coastal erosion to better inform emergency managers, planners, and residents of coastal vulnerabilities in their regions. Citizen science projects like iCoast serve the cause of Open Government and Open Data, by sharing USGS aerial imagery with the public. iCoast can also be a great tool for marine science educators to create interactive and fun lessons related to coastal hazards. 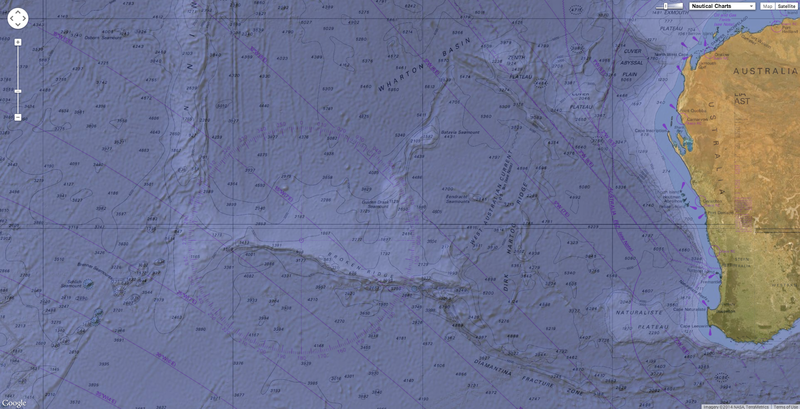 Seafloor topography in the Malaysia Airlines flight MH370 search area. Dashed lines approximate the search zone for sonar pings emitted by the flight data recorder and cockpit voice recorder popularly called black boxes. The first sonar contact (black circle) was reportedly made by a Chinese vessel on the east flank of Batavia Plateau (B), where the shallowest point in the area (S) is at an estimated depth of 1637 meters. The next reported sonar contact (red circle) was made by an Australian vessel on the north flank of Zenith Plateau (Z). 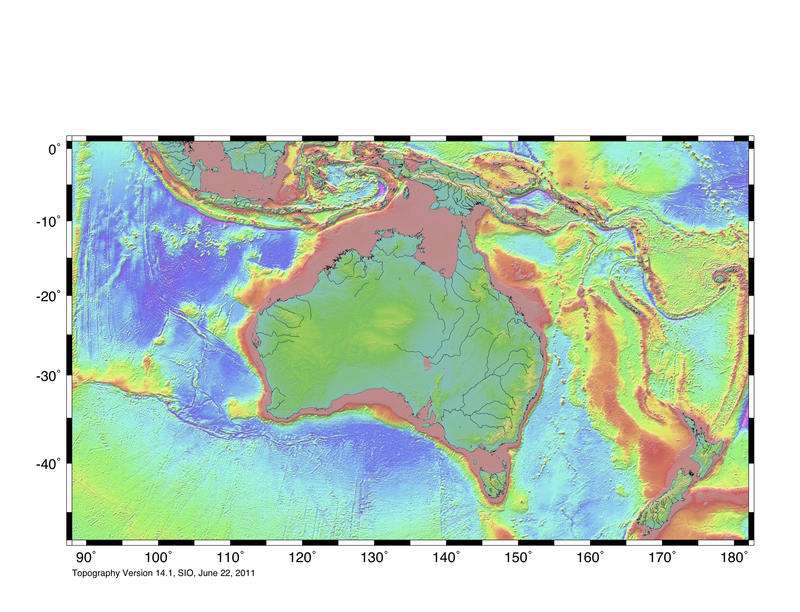 The deepest point in the area (D) lies in the Wallaby- Zenith Fracture Zone at an estimated depth of 7883 meters. The Wallaby Plateau (W) lies to the east of the Zenith Plateau. The shallowest point in the entire area shown here is on Broken Ridge (BR). Deep Sea Drilling Project (DSDP) site 256 is marked by a gray dot. The inset in the top left shows the area’s location to the west of Australia. depths are from the General Bathymetric Chart of the Oceans . Scientists have welcomed the decision to make all ocean depth data (bathymetry) gathered in the search for missing Malaysia Airlines flight MH370 publicly available. A detailed survey of 60,000 sq km of seabed is to be undertaken to help refine the hunt for the lost jet. The depth and shape of Earth's ocean floor is very poorly known. 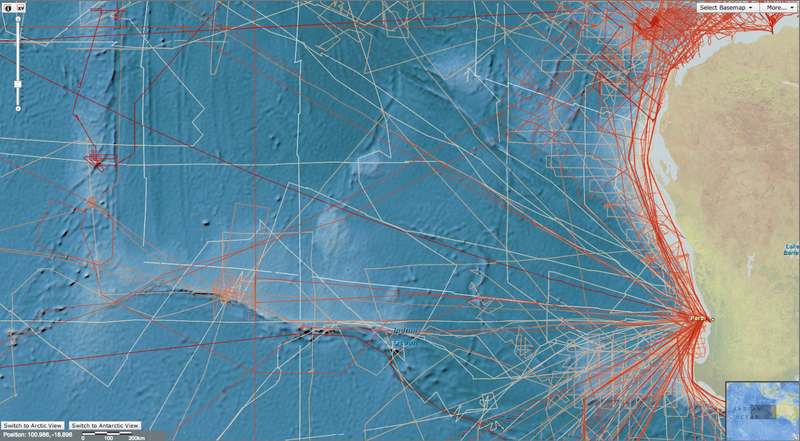 Leading researchers say the MH370 example should be a spur to gather much better data elsewhere in the world. 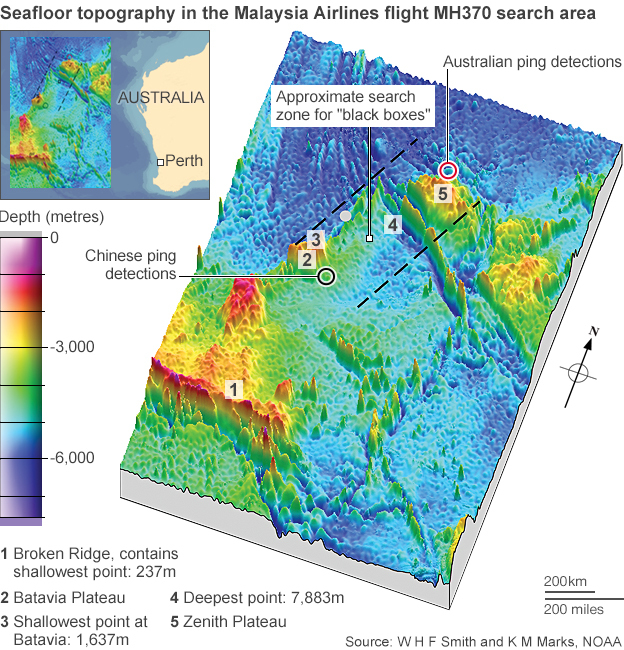 The search has been hampered by the lack of a high-resolution view of the bed topography west of Australia. This was apparent on the very first dive made by an autonomous sub investigating possible sonar detections of the aircraft's cockpit voice and flight data recorders. It was forced to cut short the mission because it encountered depths that exceeded its operating limit of 4,500m. There are places thought to exceed 7,800m. Australian Transportation Safety Board (ATSB) officials said this week that an area in the southern Indian Ocean the size of Tasmania would now be subject to a full survey using multibeam echo sounders (MBES). A Chinese navy vessel, Zhu Kezhen, has already started on the project. It will be joined by a commercial ship in June, with the work likely to take three months. 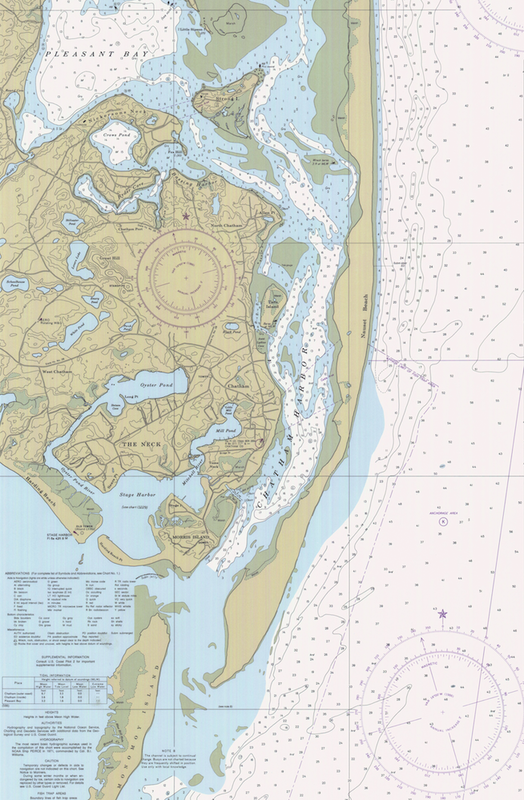 Drs Walter Smith and Karen Marks have assessed the paucity of bathymetric data in the region in an article for EOS Transactions, the weekly magazine of the American Geophysical Union. The pair work for the US National Oceanic and Atmospheric Administration (Noaa). 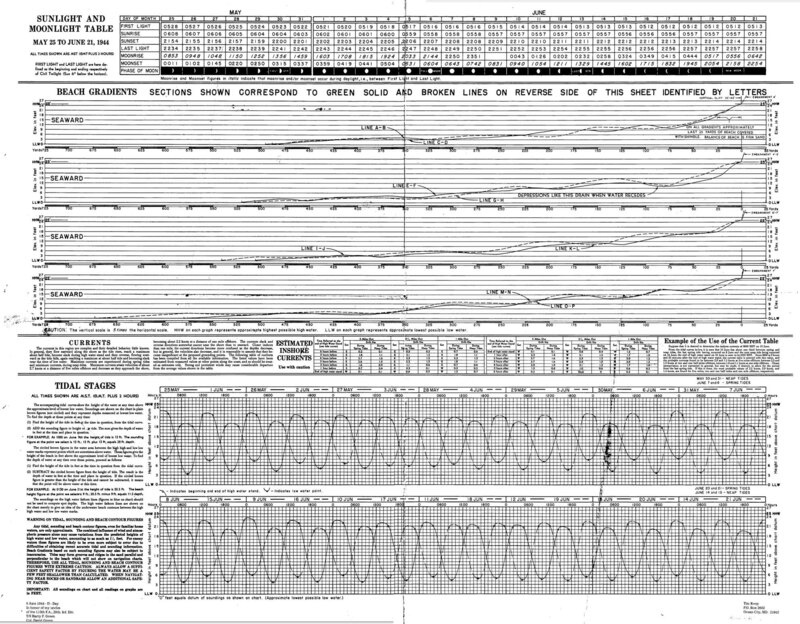 They say only two publically accessible data-acquisition sorties have been conducted close to where search vessels made possible black box detections, and "both expeditions occurred prior to the use of modern multibeam echo sounders, so depth measurements were collected by single, wide-beam echo sounders that recorded on analogue paper scrolls, the digitizing of which is often in error by hundreds of metres". Modern MBES uses GPS to precisely tie measurements to a particular location. The equipment can not only sense depth very accurately (to an error typically of 2%), but can also return information on seafloor hardness - something that would be important in looking for wreckage in soft sediment. Just 5% of a vast region, 2,000km by 1,400km, which includes the search locality, has any sort of direct depth measurement, Smith and Marks say. The rest - 95% - is covered by maps that are an interpolation of satellite data. These have a resolution no better than 20km. Maps of the arid surface of Mars are considerably better. "The state of knowledge of the seafloor in the MH370 search area, although poor, is typical of that in most of Earth's oceans, particularly in the Southern Hemisphere," the pair write. "In many remote ocean basins the majority of available data are celestially navigated analogue measurements because systematic exploration of the oceans seems to have ceased in the early 1970s, leaving the ocean floors about as sparsely covered as the interstate highway system covers the United States. "When these sparse soundings are interpolated by satellite altimetry, the resulting knowledge of seafloor topography is 15 times worse in the horizontal and 250 times worse in the vertical than our knowledge of Martian topography." Smith and Marks hope that the detailed survey work now being conducted in the search for MH370 will be a catalyst to gather better data in other parts of the globe. 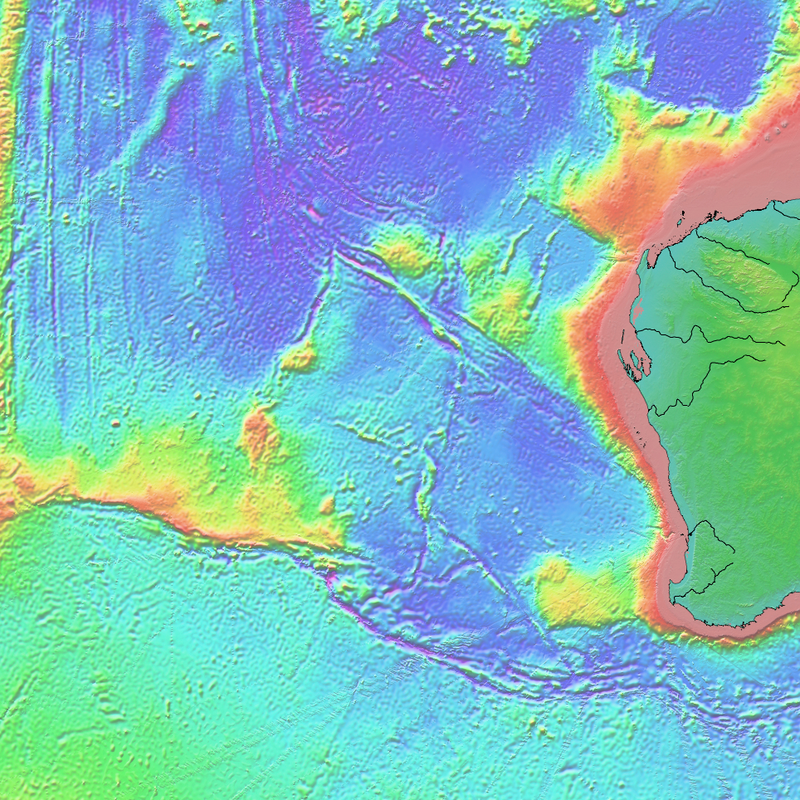 High-resolution bathymetry has myriad uses. 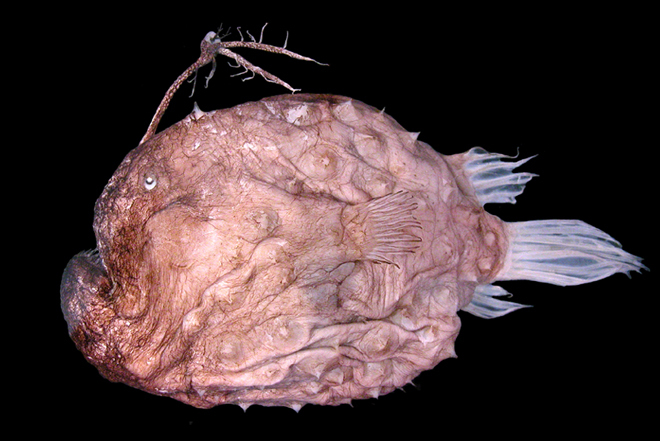 "Better knowledge of the ocean floor means better knowledge of fish habitats. This is important for marine conservation, and could help us find biological resources including new medicines," Dr Smith told BBC News. "It means also a better ability to assess the mineral resource potential of the seabed. And it means better knowledge of the obstacles to flow that cause turbulence and mixing in the oceans. "We need this mixing and circulation information to make good models of future climate. 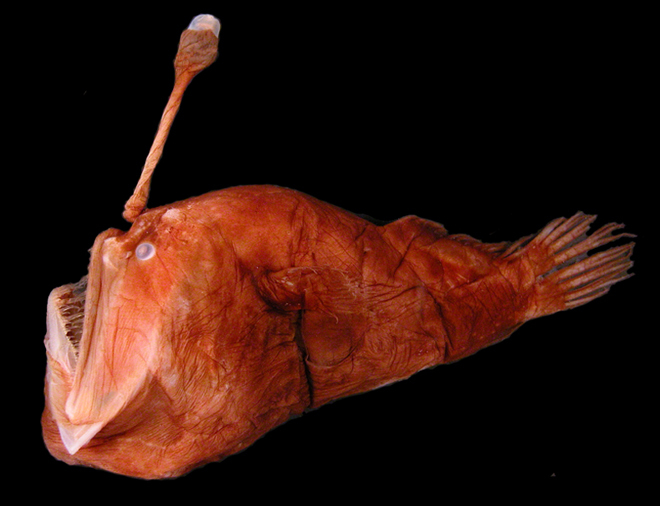 All of these things depend on knowing the topography of the sea floor." The Australian Joint Agency Coordination Centre, which disseminates all information on the hunt for MH370, confirmed that the MBES survey data would be publicly available. "The bathymetry data gathered in the course of the search for MH370 will become the property of the Australian Government. Recognising the importance of that data, it will be made available to the public via both Australian and international databases," the JACC told the BBC. On Tuesday, all the raw satellite data from the London telecommunications company Inmarsat was also put in the public domain. It was this information that led investigators to look for wreckage in the southern Indian Ocean. Footage from the movie "Deep Water" about Donald Crowhurst's suicide at sea.